Truth be told: as a wedding photographer, I’ve been to my fair share of churches. And I can definitely say that when it comes to churches in Toronto, there are some pretty great options! From stunning cathedrals to intimate chapels, to breathtaking synagogues and jaw-droppingly beautiful orthodox churches, there are plenty of choices. 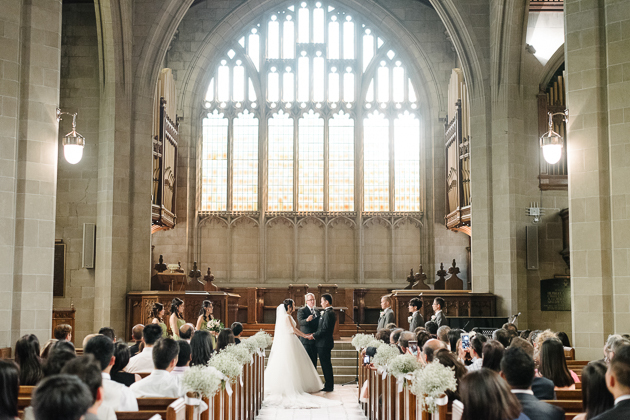 Sometimes couples will choose a church that is sentimental and has historic meaning to their family. Others will prefer something with a major wow-factor. Whatever your motivation is, you may be surprised to see that some of these gorgeous locals are in Toronto! 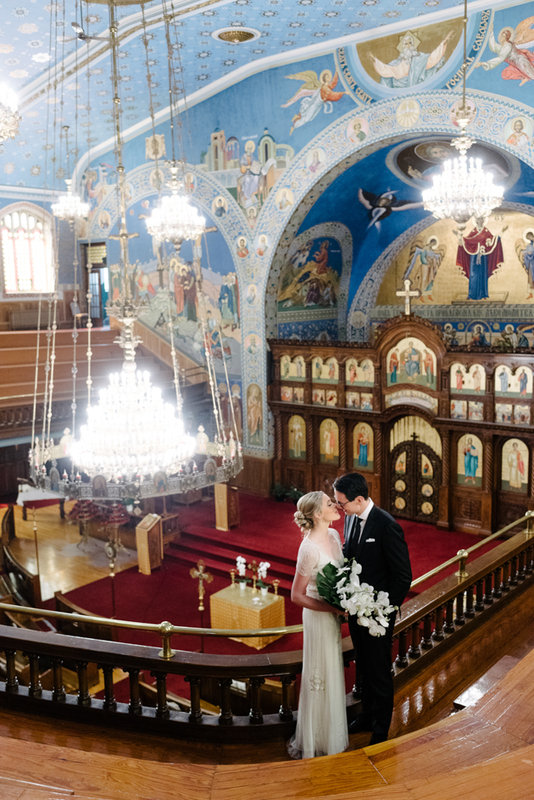 We’ve compiled a list of Toronto’s top 11 most beautiful churches to get married in. Over on the east side, you’ll find St. Paul’s Basilica. The renaissance design of this church makes you feel like you’ve escaped to Europe. With all the vast domes and columns it easy to see how it landed on our most beautiful churches in Toronto list. 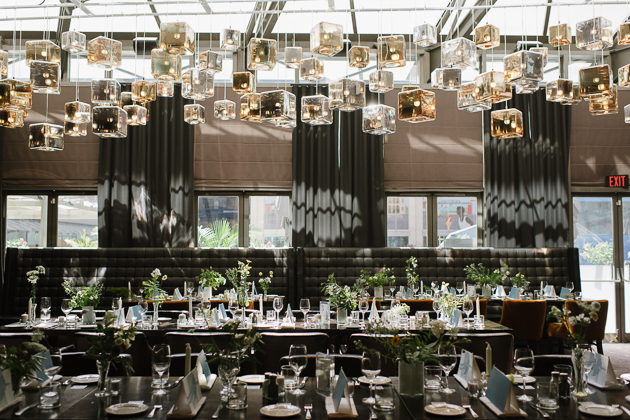 Here’s a fun fact: when signing the marriage documents you are taken to a private room at the side room which always has that stunning, magical light. Features: A beautiful church with pastel coloured decor, an upper balcony and a secret side room! At the top of our list is Trinity College Chapel. 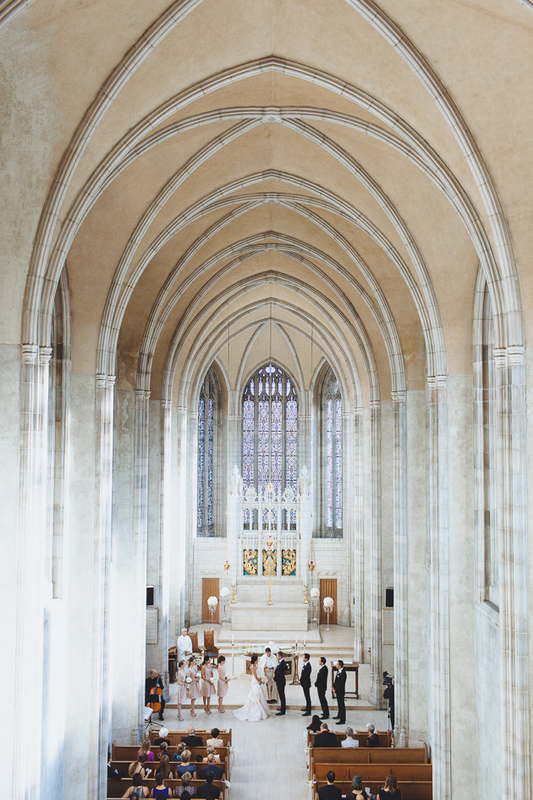 This Gothic Cathedral is located right in the middle of the University of Toronto and is one of our favs to shoot at. It is so bright and airy – which is very rare for a church! We always know the images are going to come out absolutely beautiful. Right outside is the Trinity quadrangle. With a recent renovation, the Trinity quadrangle is a hot spot for couples who are looking for a place that combines stunning architecture with lots of greenery. Features: An upper balcony, beautiful quad and they are pretty relaxed in terms of photography restrictions. 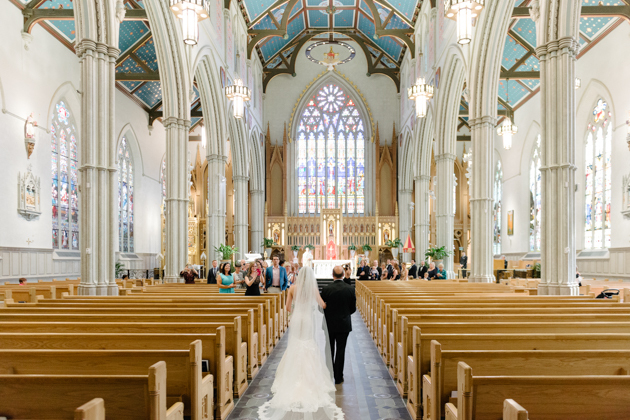 St. Michael’s Cathedral Basilica is considered one of Toronto’s iconic landmarks. 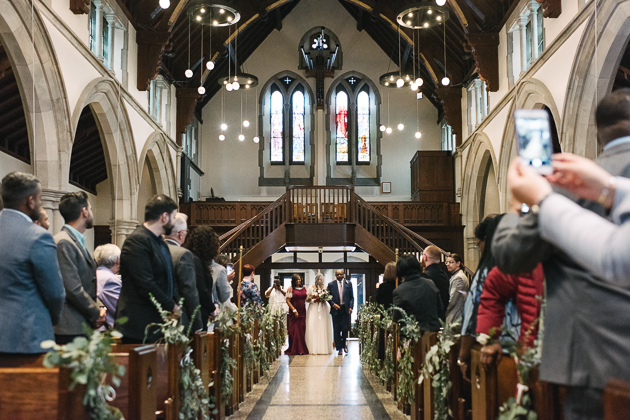 Beautiful archways and stained glass windows are some of the striking features that make it one of our favourite churches in Toronto. Located downtown, it’s a gorgeous spot and is a perfect option if you’re planning on celebrating your wedding day in the city. Please note that typically your photographer won’t be permitted to photograph from the middle aisle. But not to worry, you can still get some awesome photos from the sides! Features: Downtown location with beautiful design details like stained glass, arched doorways and soaring ceilings. St. Nicholas Ukrainian Catholic Church is a hidden in plain view gem! Located in Queen West area, this church has made its way to our most beautiful churches in Toronto thanks to its richly colourful decor. The large, upper balcony make dreaming up of cool angles a reality. And how about that ceiling? Look up, and you’ll find a blue view that is super ornate. 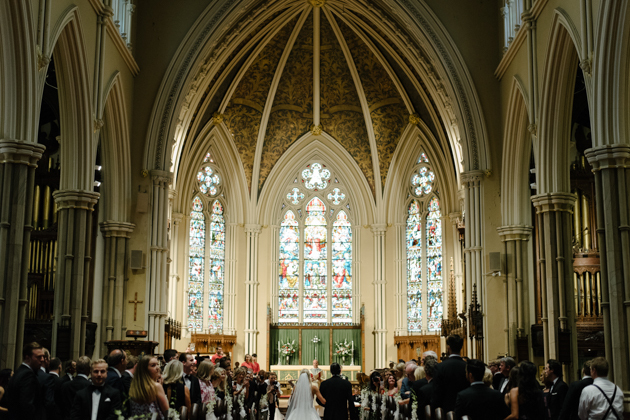 Features: Close to Trinity Bellwoods, this church is super colourful and oh-so-memorable! 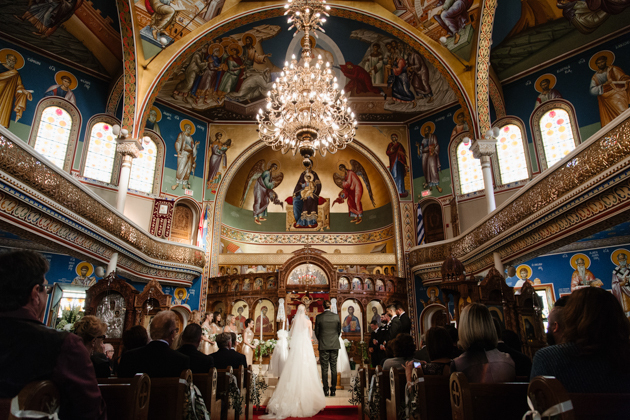 Saint George’s Greek Orthodox Church is such a gem! You won’t believe the frescoes that line the walls in their vibrant hues of blue, red and gold. There’s a red, winding staircase that I love using to capture some stunning, graphic images while the bride is making her way to the altar. This church is full of character – your guests will remember it for years to come! Features: An upper balcony and colourful decor with gold, blue and red frescoes. Are you looking to amp up the drama? If yes, then this church at the University of Toronto is for you! The cathedral has beautiful south-facing windows that allow for a lot of natural light to filter through. The best part is that you get first dibs to use the grounds for your wedding portraits. Knox College is indeed one of the most sought after locations for the wedding day since it is gorgeous and works beautifully no matter the weather! So make sure you book it early as dates tend to fill up quickly. Features: Stunning design, a second-floor balcony and you can bring your own minister! It’s easy to see why the Metropolitan United Church is one of our favourite churches in Toronto. 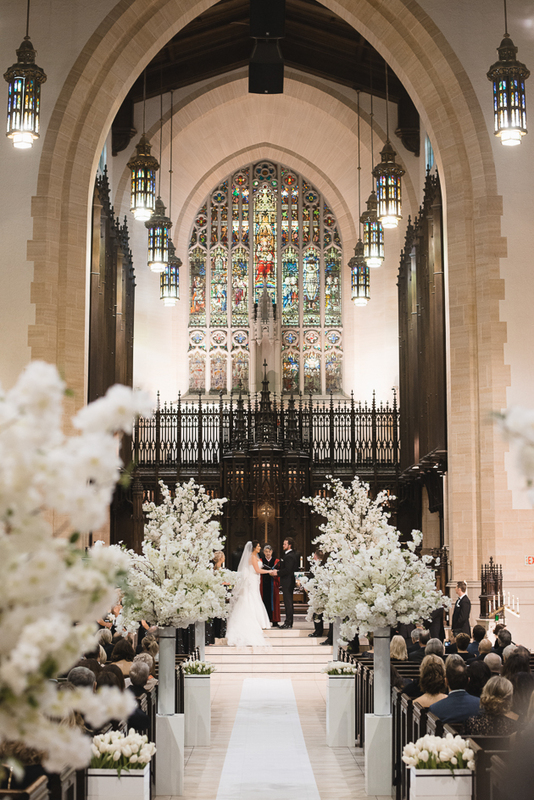 Honestly, this stunning cathedral looks perfect for a royal wedding! It has super high ceilings and is a dramatic mix of dark wood and light brick. 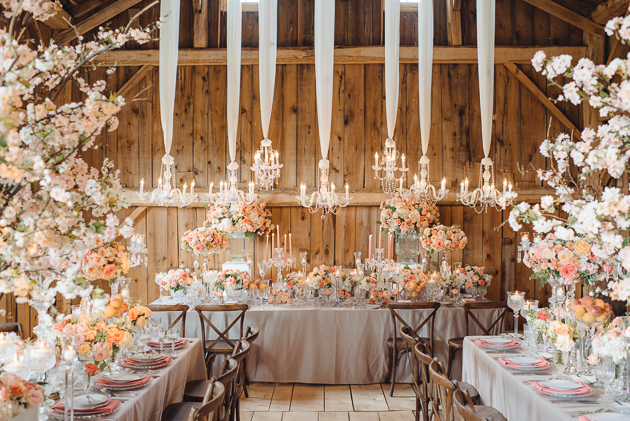 Florals of any kind look stunning in this space because of the neutral palette. Also, the exterior has some great backdrops for the first portraits of the married couple hot off the press. Features: This downtown church has dramatic features and an upper balcony. 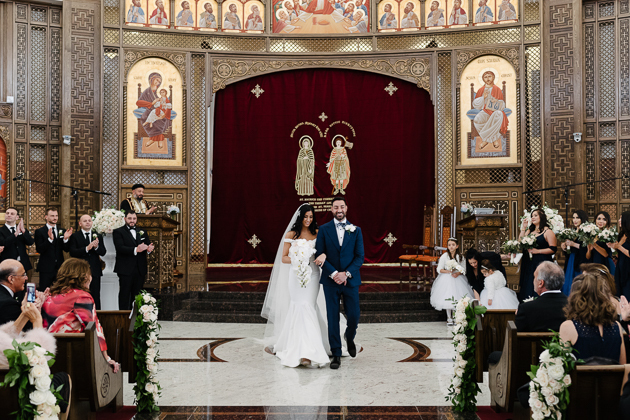 With lots of natural light, St. Maurice And St. Verena Coptic Orthodox Church is a fantastic mix of ornate and modern styles. 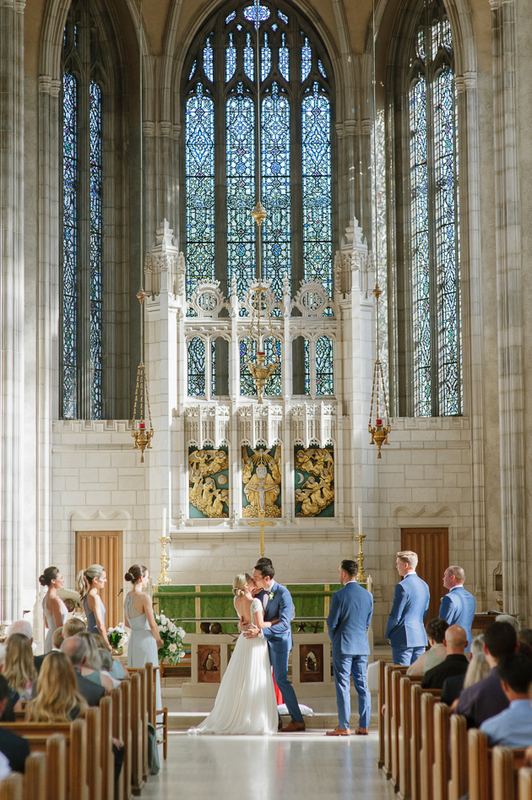 There are a lot of windows at the front of the altar, and the floor is light in colour which means you can expect a lot of flattering light bouncing around – great for wedding photos! Also, they let you walk around the altar if your photographer takes off their shoes! Features: Newer building with an upper balcony and a super ornate altar. 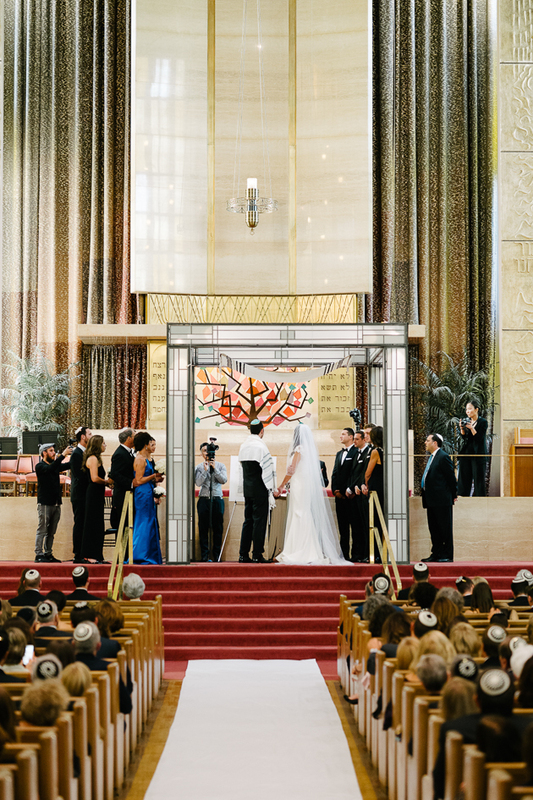 This gorgeous Synagogue has it all! Located in Forest Hill, the grounds provide lots of options for great photography spots. The synagogue is spacious which means you can keep that guest list long. With lots of windows and high ceilings, picture a ceremony basking in natural light. The upper balcony allows for some epic shots that you will be marvelling in for years to come! Features: Located on beautiful grounds, this is your one-stop shop for ceremony, reception and caterer. This church is fit for a fairytale. With its white walls and dark, wood ceilings, the vibe is totally Harry Potter. 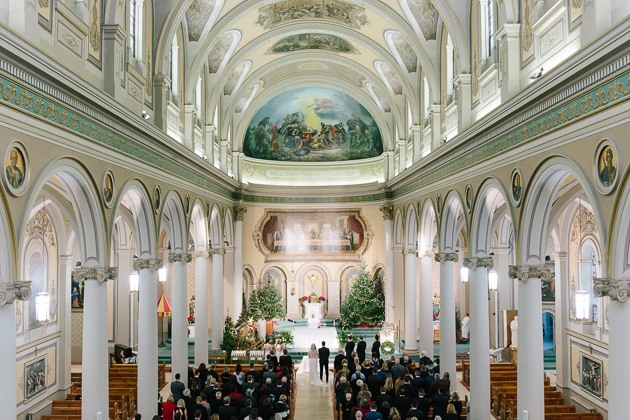 The balcony allows for some epic, wide shots for when you’re walking down the aisle. Also, they aren’t strict here, so your photographer is free to move around to make sure they are capturing the best shots. Features: An upper balcony, rustic wood ceiling and a relaxed, intimate vibe. Another church considered culturally significant is the Cathedral Church of St James. With a copper roof and light, stone exterior, its appearance is definitely unique for Toronto standards. Inside you’ll find a rustic, wood ceiling and stained glass; features which make this space feel moody and romantic. Its majestic interior and a photogenic exterior definitely make it rank high on our list! However, this church is a little strict when it comes to photography. If your photographer is a pro then not to worry, you can still get some beautiful shots! Features: This beautiful church is right beside a park and features an upper balcony and ornate details. > Next post : QUIZ: Find Out Which 2019 Wedding Dress Trend Is The One For You!